On September 10th, we celebrate the Battle of St. George's Caye. 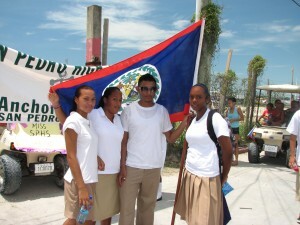 This is the time of the year when Belize dresses itself with its patriotic colors: blue, white and red. Allow us to take you back in time through this historical event. The following information is taken from the book "I love to tell the story" by Lawrence Vernon. The historical encounter we refer to today as "the Battle of St. George's Caye" took place in 1798. One of the most popular questions that historians have asked when relating to this fight is: Why did the Spaniards assemble such a huge invasion fleet to attack the tiny settlement of Belize? For some sort of answer we have to look back at the period between 1715 and 1760, during which the Spaniards drove the Baymen from the Settlement on many occasions. Since the Spaniards never attempted to occupy the area, the Baymen always returned to the logwood forests. Prior to 1798 the Spaniards attempted to invade Belize at least six times, and only once were they successful when in 1779 Spanish ships surprised the inhabitants of St. George's Caye, burned down the buildings and took away 140 prisoners. These were imprisoned in the dungeons of Havana and not released until 1782. The Spanish incursions started as early as 1718 when an attempt was made to dislodge the settlers from the Belize River by a land expedition from Peten. Mention is made of an unsuccessful Spanish attack in 1726, and again in 1730 when fifty prisoners were taken. 1745 saw the destruction of the camps along the New River and the capture of several slaves. In 1747 the Spaniards compelled the Baymen to move to Roatan; and in 1745 an attack was made by way of Peten which was halted at Laboring Creek by some Baymen and their slaves. After 1760 two treaties came on the scene which seem to have solidified the Baymen's resolve to retain the Settlement of Belize. The Treaty of Paris, 1763 allowed Spain to recognize the logwood cutting activities of the Settlement for the first time. Since no boundaries were drawn, this perhaps gave the Spaniards cause to destroy the St. George's Caye settlement in 1779. The Treaty of Versailles, 1783, along with a Convention of 1786, gave the Baymen the right to cut and carry away logwood with certain boundaries; to cut mahogany; and to reoccupy St. George's Caye. Based on a report by a Spanish Commissioner who visited the Yucatan that the Baymen were extending their logwood cutting borders dangerously close to a nearby Spanish town, Spain issued orders for the immediate and effective expulsion of the settlers occupying the Settlement. In March of 1796 it was reported that the Spaniards had started warlike preparations in the neighborhood. This, of course made the people of the Settlement very worried, and the Baymen immediately requested defensive help from the Governor of Jamaica, who complied by sending Lieutenant Colonel Thomas Barrow to the Settlement as Commander-In-Chief. As a point of interest it is worthy of historical note that this move revived the Superintendency, a step which was to have a very important effect on the constitutional development of Belize. Barrow also brought a degree of militarism to the Settlement as he immediately mounted regular guards and paraded the men, proving to be a much more gallant spirit than the unruly Baymen. Then hail them - cheer them. The Battle of St. George's Caye. Hip! Hip! Hurrah. Hip! Hip! Hurrah.